Garlic is my favorite flavor and I love them in anything. I always try to incorporate a couple of pods into a lot of dishes that I make. 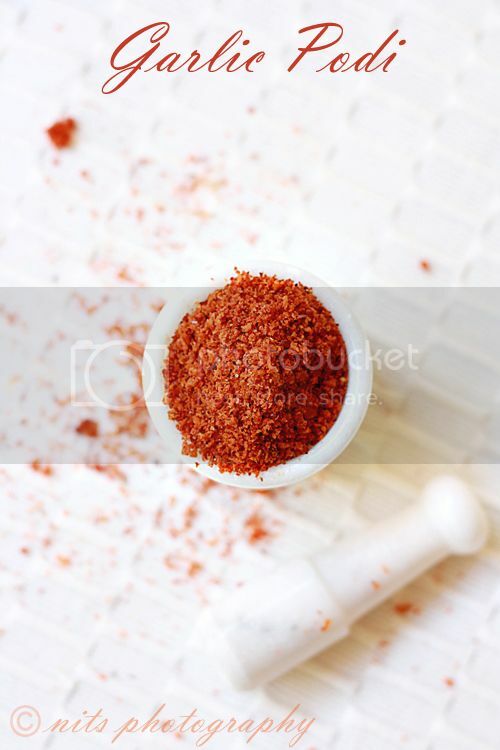 This podi is no wonder my favorite :) Its very simple to make and mess free side dish. Scrape the dry coconut and run it in the mixie to get smooth powder. 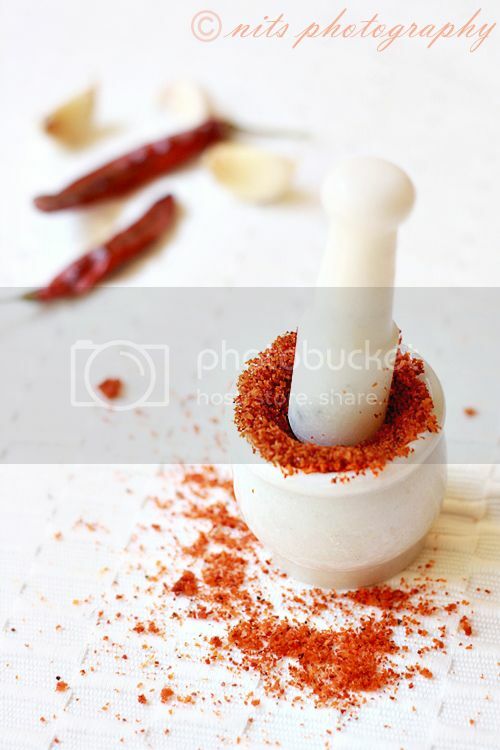 Add salt, chilly powder and garlic pods and grind again until fine powder. Take a tsp of ghee in a pan and fry this powder for two minutes. Spread it on a plate and allow it to cool for a while and then collect it in an airtight box. You can store and use this within 10 days. Looks stunning... I have a similar kind of shots with me..
Hi Nithya very nice pics and I love this podi! 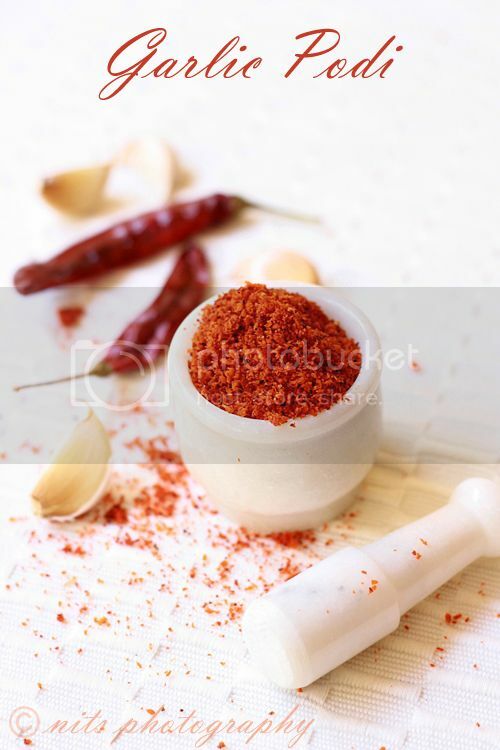 oh the cute mortar and pestle!! and this podi looks so tempting and delicious!! Podi looks so colorful and flavorful. 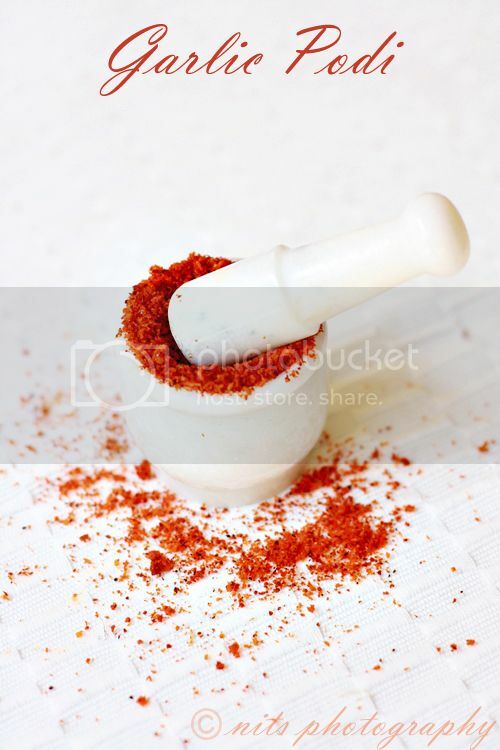 I love using mortar and pestle...Garlic podi looks fiery and very spicy..Great shots Nithya. Had been waiting for this post..looks absolutely tempting. Will surely give a try but have ti hunt for dry coconut first...Beautiful bright clicks! Oh bright red colour brings life to eyes, and beautiful picture...oh garlic is best in life!